Show your support for the Indigenous Peoples of TIPNIS! Show your support for the Indigenous Peoples of TIPNIS! Avaaz.org has sponsored a petition in support of the ongoing march to defend the Isiboro Sécure Indigenous Territory and National Park (TIPNIS) in Bolivia. Since August 15, 2011, Indigenous Peoples from the TIPNIS have been marching against a new highway that the government of Bolivia wants to build through the protected territory. So far, more than 1,500 people have joined the 375-mile journey from the eastern lowlands of Bolivia to La Paz–a number that’s growing by the day. Sadly, President Evo Morales has responded to the march by labeling the protesters “enemies of the nation.” He is also trying to discredit the protesters by portraying them as being confused by NGOs. He even tried to denounce the march as another strategy of US imperialism. At this point, there’s no telling what will happen next. Sufficed to say, the international community should be on alert for the worst possible outcome. For news and updates on the situation, visit: IsiboroSécure, TIPNISResiste, SomosSur, Fundación Tierra, CIDOB, and CEJIS and Bolivian Thoughts. You can also find updates on facebook: TIPNIS en Resistencia“, “Amigos del TIPNIS” and Salvemos al Tipnis. 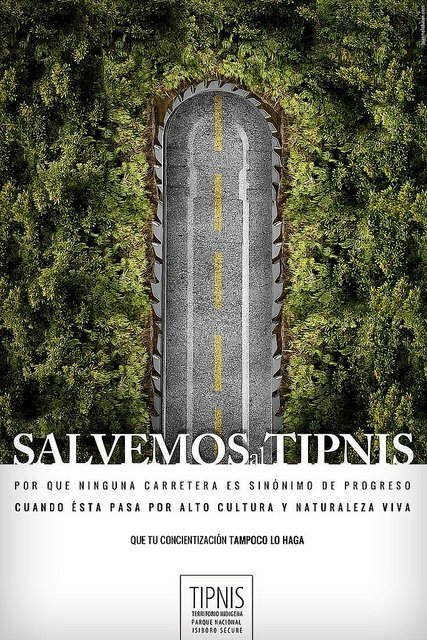 TIPNIS: Territory and Dignity, a moving documentary from Claudia Fernandez and produced by environmental organization FOBOMADE, gives voice to the Indigenous Peoples of the Isiboro Sécure Indigenous Territory and National Park (TIPNIS) in Bolivia.